of the science of photobiology. In Plastic Case with Color Covers. Do fluorescent lights cause cancer and childhood learning and behavior disorders? Can long-term exposure to low-level radiation as from TV sets, computers, fluorescent lights, and similar devices harm your health? Does living behind window glass and with glasses covering our eyes over years affect our health? Is natural sunlight and trace ultra-violet radiation really harmful to our health? Or is it necessary and beneficial? How do cells, plants and animals respond to constant exposure to different light color frequencies? Does mal-illumination and electrosmog create nervous agitation and a weakened immune system? These and similar questions were the subject of Dr. John Nash Ott's pioneering investigations in the field of photobiology, using the methods of time-lapse photography. In an era of increasing low-level electromagnetic pollution, where everyone is "wired up" to the internet 24/7, and even children have the latest cell phones, iPods, blueberrys and other Wi-Fi gizmos, with eyeballs glued to display screens, Dr. Ott shows we are paying the price with our health and biology. Our indoor lifestyles and chronic wearing of UV-blocking eye-glasses and contact lenses additionally has deprived us of biologically-necessary natural trace-ultraviolet and bluer frequencies of light, with an irrational and nearly superstitious fear of natural sunlight. 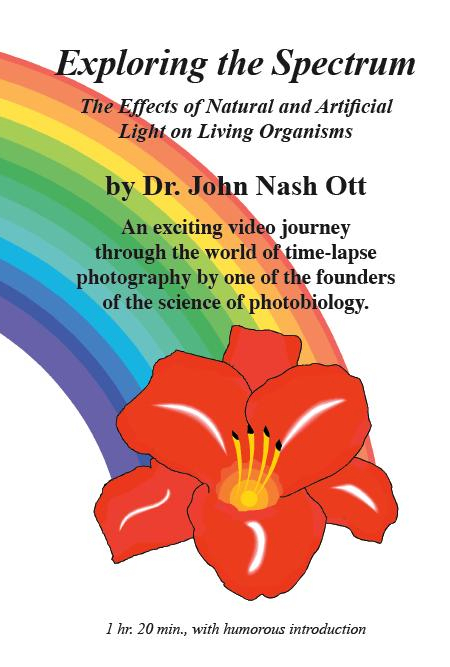 Dr. Ott's time-lapse movies, reproduced here, show how plants and animals are deeply affected in movement, growth, form and sexual behavior, by these significant bioenergetic changes in our natural living conditions. This is a wonderful video showing Dr. Ott's original film sequences, including entire plants growing from a seed to fruit in less than a minute. A fascinating nature study for both adults and children! Dr. Ott founded Ott Pictures, and the Environmental Health and Light Research Institute in Sarasota, Florida. Many of the time-lapse sequences in several of the late Walt Disney's films, such as Secrets of Life and Nature's Half Acre are the work of John Ott, as well as the time-lapse sequences in Paramount's production On a Clear Day You Can See Forever. Digitally remastered from Dr. Ott's original films with a better quality than the old VHS version! We still have a few copies of different books on the subject of health and light, found in our "Health and Healing" book section. For example, The UV Advantage and Light, Medicine of the Future which confirm or extend Dr. Ott's ideas on the importance and health-benefits of natural low-intensity trace-UV light. Also see Dr. Ott's own books such as Health and Light available from Amazon and other bookstore.